Frugal & Fabulous: Frugal Fashion: Saving Money When Buying Clothing! Frugal Fashion: Saving Money When Buying Clothing! I love clothes. And handbags. And shoes. Okay, okay, I love shopping in general. But it's pretty rare for me to buy anything without some sort of sale, coupon or discount code. So here are my top tips for saving money on clothing! Stockpile essentials. Yes, use the same method you use for saving money on groceries and health and beauty products. 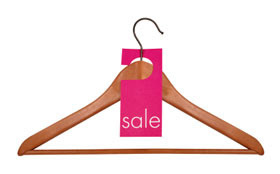 If it's on clearance and it's something you'll definitely wear (say, camisoles or dress pants) buy multiple! A few weeks ago I hit an amazing sale at a department store. I found work tops for $3 and $5-$7! I came home with a huge bag filled with tops for less than $30. I can't tell you how many times I've kicked myself for not buying more at a sale like that. I know it can be hard to spend a lot at one time - but it really will pay off in the end. Shop ahead - Don't wait to the last minute to buy an outfit for a special event or for the holiday season. Start early (preferably months ahead) and have an idea of what you're looking for in mind. Buy neutrals and basics that can be worn across the seasons! Take a second look at your purchases before checking out. Ask yourself, will I really wear this? Do I love it? Live by your own return policy: I have a two week rule for all new clothing. Unless I'm buying an outfit for a specific event - if I haven't gotten excited about something and found a way to wear it within 2 weeks - it goes back. Swap clothing and accessories with friends! As they say, one gal's trash is another's treasure. Wouldn't you rather see a friend enjoy last year's bag than have it sit in your closet? Search for coupon codes: Before you check out, search Retailmenot.com Swagbucks or even plain old google! Let someone else find the deals: Check out sites such as dealcatcher.com and fatwallet.com for hot deals!